Most of you are probably done with teacher and staff gifts as the school has ended in the U.S., but it haven't started here in France, so I'm not late for this. We all have this I-can-do-something-with-this box that we keep in case we have an epiphany about creating something with it. In fact, I got several of them... 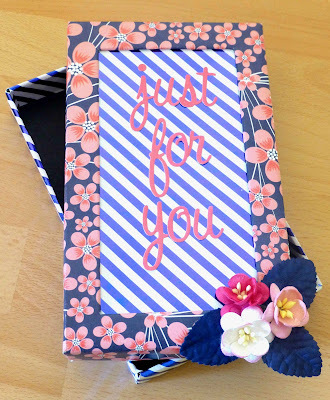 I finally had an idea for this old phone case gift box I kept for like 3 years ! Did you notice it matches perfectly the card I made few days ago ? OK, one done. How much to go already ?